LAMROC is a mobile lab that enables non-destructive, high-resolution spatial measurement of various drill core parameters (density, magnetic susceptibility, geochemistry, mineralogy). Its semiautomatic system also allows the acquisition of continuous drill core images. The goal is to make full use of drill cores, by deriving as much information as possible for geophysical, geological, mining exploration and environmental applications. The lab obtains profiles of the various parameters, depending on the drill depth, and this information enables improvements such as better separation of lithologies (especially for altered and fine-grain rock) and detection and measurement of hydrothermal alteration and mineralization. 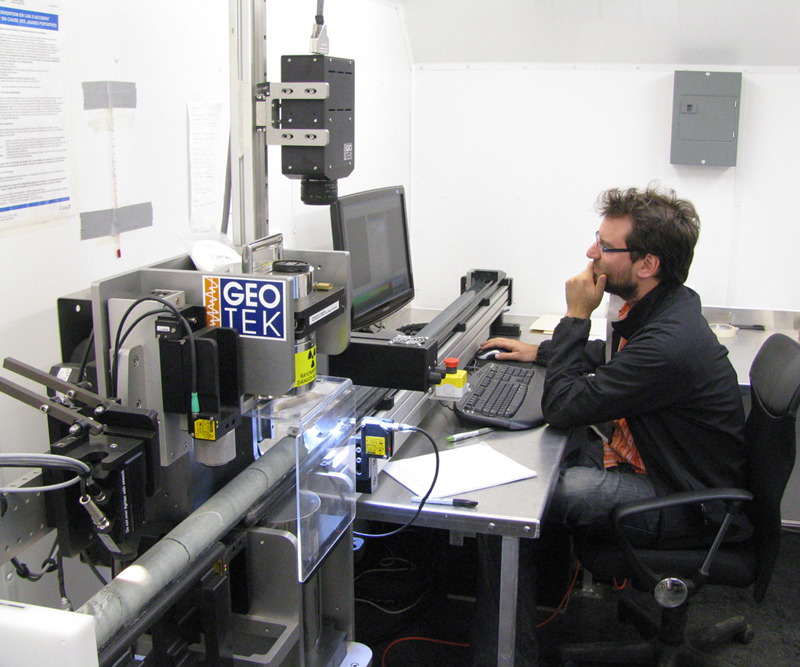 Measurements are taken directly at the sites where the drill cores are stored, or the cores can be sent to Quebec City for analysis. Enables detection and semiquantification of numerous minerals, primarily those produced by hydrothermal alteration. Credit: Traduit de Ross, P.-S., Bourke et A., Fresia, B., 2013. A multi-sensor logger for rock cores: Methodology and preliminary results from the Matagami mining camp, Canada. Ore Geology Reviews 53, 93-111. Alexandre Bourke, M.Sc., operates the mobile lab.